This recipe graciously inspired by FoodEditorials.com and embellished delightfully by Lauren’s Madre. 1. Chop oregano, basil onion, garlic and mushrooms. 2. 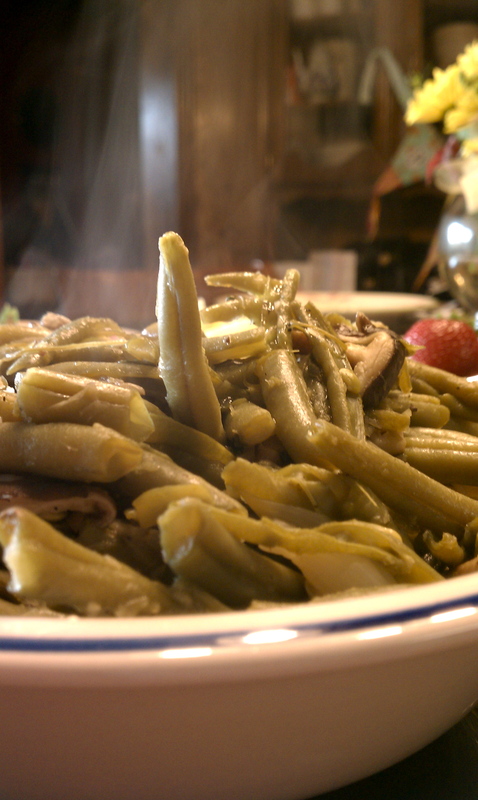 Add all chopped ingredients and string beans to pot over stove. 3. Add water to pot, 1/3 depth of green beans. 5. Bring to boil and then simmer covered over heat for 30 minutes or until done. Lauren loves green beans. Loves them. These are no exception. The recipe inspired graciously by Elaine Gloria Gottschall of Breaking the Vicious Cycle: Intestinal Health Through Diet. 1. Clean and chop carrots, onions and celery. 2. Place chicken pieces and vegetables into large pot, add parsley and salt to taste. 3. Fill pot to cover with water. 4. Simmer pot for 4 hours. 6. Let chicken pieces cool, then de-bone and de-skin chicken. 7. 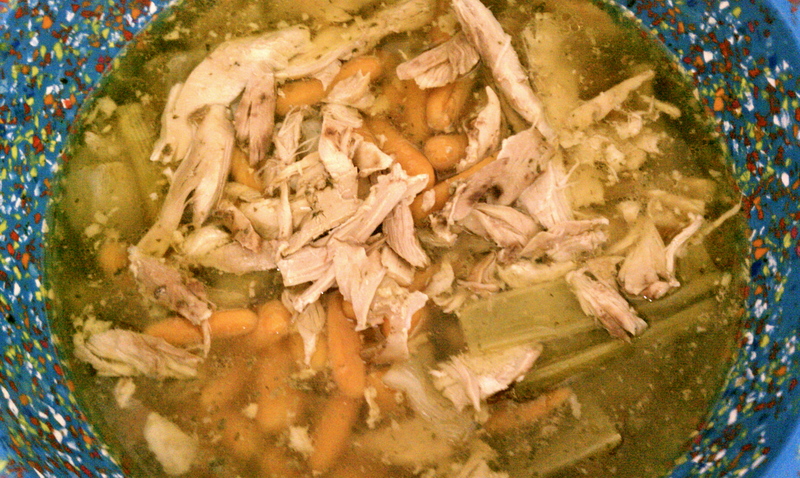 Place veggies and chicken meat back into broth and enjoy! This recipe stolen graciously from Emeril. 1. In the bowl of a food processor, combine the olive oil, red wine vinegar, lemon juice, basil, garlic, shallots, cilantro, oregano, parsley, jalapeno and crushed red pepper. 2. Pulse until well blended but do not puree. 3. Stir in 1/2 teaspoon of salt and 1/4 teaspoon of the black pepper. 4. Remove 1 cup of the chimichurri sauce from the processor and transfer to a non-reactive bowl, cover with plastic wrapand reserve at room temperature for up to 2 hours. 5. Season the pork chops on both sides with the remaining 2 teaspoons of the salt and the remaining teaspoon of the black pepper and place in a large, resealable plastic food storage bag. 6. Add the remaining chimichurri sauce from the processor into bag covering the chops. 7. Seal bag and refrigerate the pork chops for at least 2 and up to 4 hours. 8. Preheat a grill to medium. 9. Once the chops have finished marinating, remove them from the refrigerator and let them come to room temperature for 45 minutes. 10. 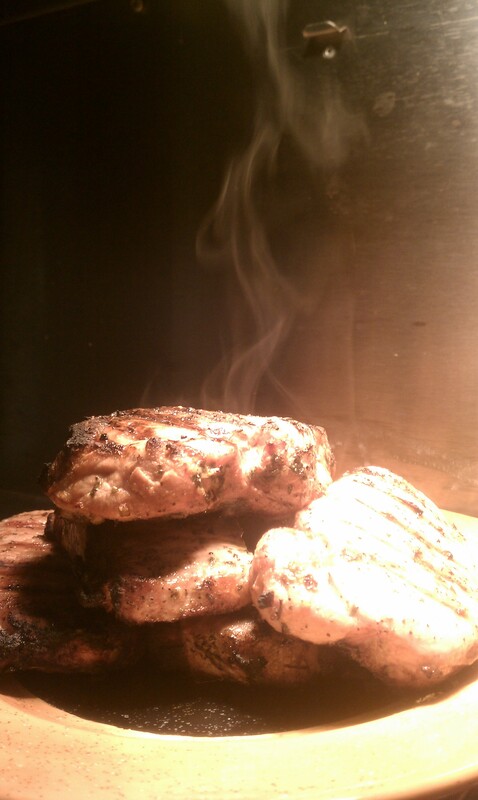 Set the chops over the hot grill and cook for 7 to 8 minutes on each side. 11. 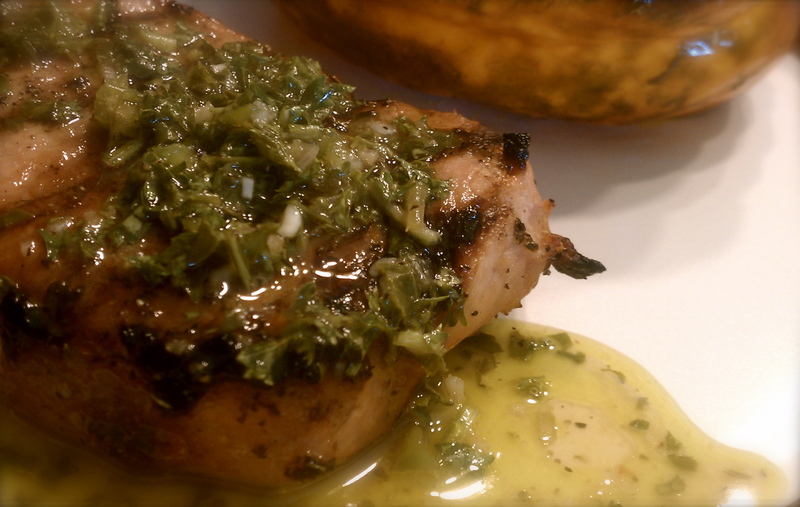 Once cooked through, serve the chops and pour 1/4 cup of the reserved chimichurri sauce over each chop before serving. 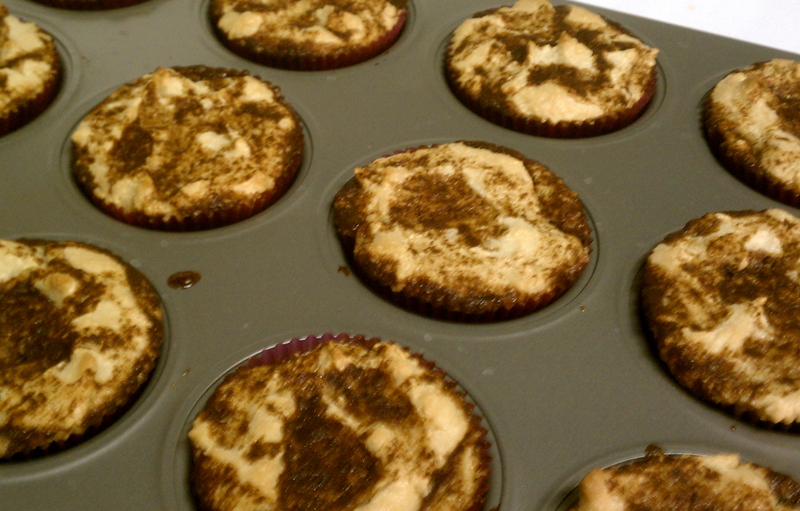 This recipe graciously inspired, practically stolen, from Giada. 2. In a medium bowl mix together the roasted red bell peppers, olives, cheese, scallions, olive oil, salt, and pepper. 3. 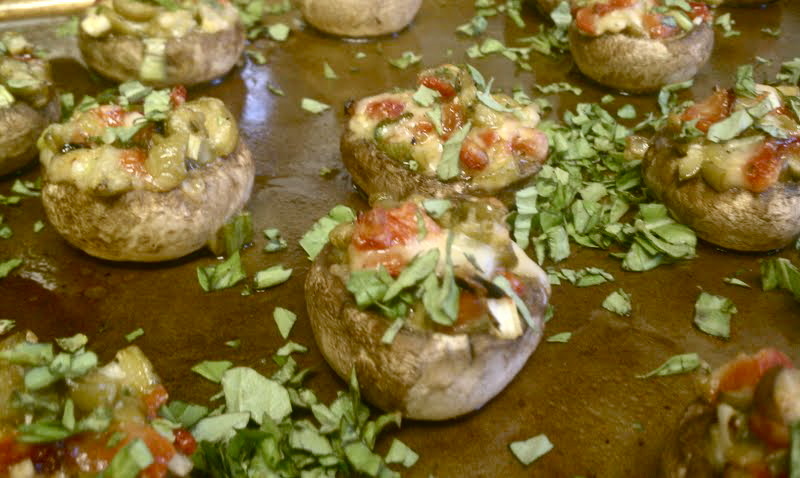 On a greased or parchment paper-lined baking sheet place the mushrooms, cavity side up. 4. Spoon the filling into the cavity of the mushrooms. Bake until the mushrooms are tender, about 20 minutes. 5. Transfer the mushrooms to a serving platter, sprinkle with chopped basil, and serve. This recipe graciously stolen from nomorecrohns.com. 1. Mix all ingredients together in a blender for a light, fluffy texture. 2. Pour onto a buttered electric griddle (preferably) set at 275 degrees or a buttered pan. 3. 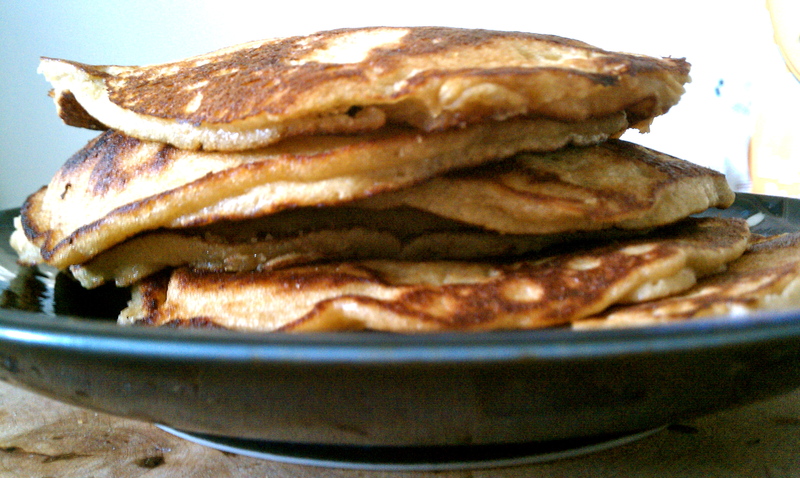 Cook slowly until golden brown; (a bit longer than for regular flour pancakes). 4. Serve with warmed honey and/or jam. This recipe graciously inspired by Grechinlin. 1. If frozen, thaw the shrimp under running water. 2. Add olive oil and butter in a small skillet, until melted. 3. Finely dice onion, shallot, garlic, parsley, and chives. 4. Add onion and shallot to skillet, let those cook until soft. 5. Add garlic and cook for a couple more minutes. 6. 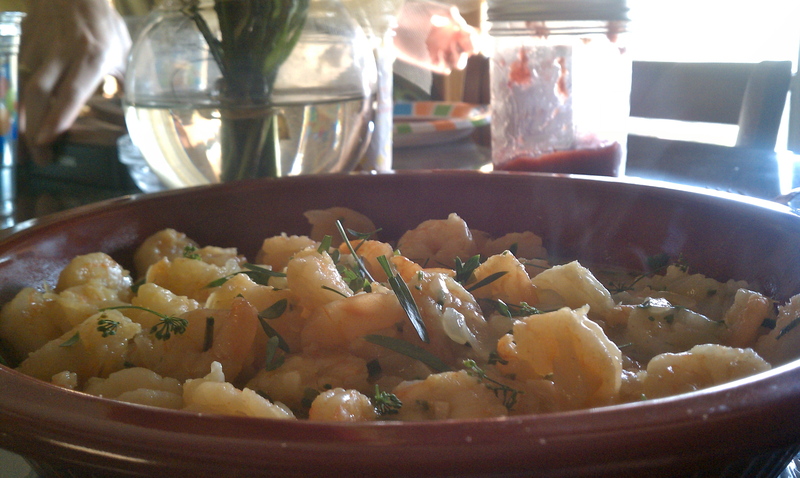 Add the shrimp, chives, paprika, and parsley, and let cook through. So we had one problem when we made this… It was good, but we felt like the shrimp themselves needed more flavor. Perhaps instead of precooked/frozen, next time we’ll try fresh. The sauce was good and the shrimp were good, but we wanted more integration!